Hosting an event, and want to make it your very own? Kreativkitchen has got you covered. A tasty invitation design by Kreativkitchen can add some of your own flavour to your event. A gathering… anything you can throw a party for! 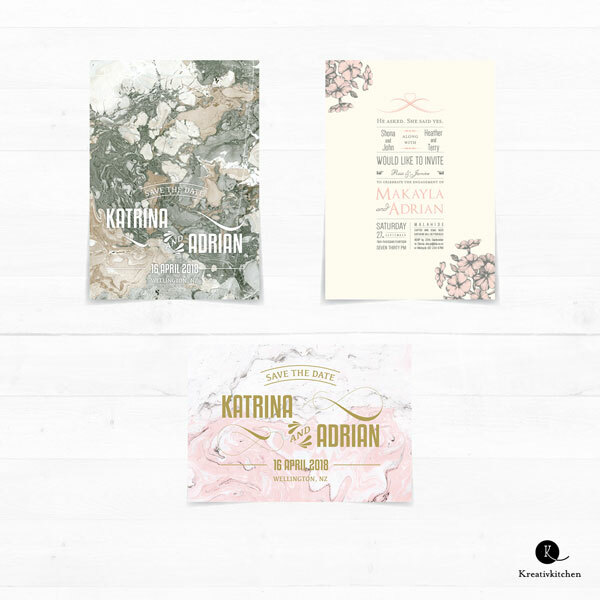 Invitations, menus, programmes… if it needs to be unique and beautiful, Kreativkitchen can help. Just contact us and we’ll start preparing the ingredients! Special deals for non-profit organisations, sometimes even at no cost! We love to help the local community. It gives us feel-good tinglies. It might be easier to ask what we don’t do. You name it, we probably do it. Brochures, menus, logos, stationery, posters, wedding invitations, and more. Not sure? Contact us and ask. We like to think our clients are our friends, and that we deliver more than just graphic design. We deliver a pleasant experience in addition to top notch work. Read more about us. We speak your language. No artsy-fartsy double talk here. We have 15 years experience in graphic design, typography and pre-press. Most importantly, we love what we do and it shows. We understand that most clients don’t have a lot of time. That’s why we offer our services mainly online. Thanks to email and internet it’s super easy to get things across the way you want them to. No need to meet unless you want to. Due to the arrival of our little one, Kreativkitchen will be closed from 1 December 2018 until 5 May 2019. We thank all our clients for being so understanding and look forward to working together with you next year!